Discovered by a bunch of intrepid Spanish youths in 1959, the caves of Nerja are an impressive find. They are believed to be about 5 million years old. I enjoy a good cave, but don’t think I have ever visited any caves as enormous as these. 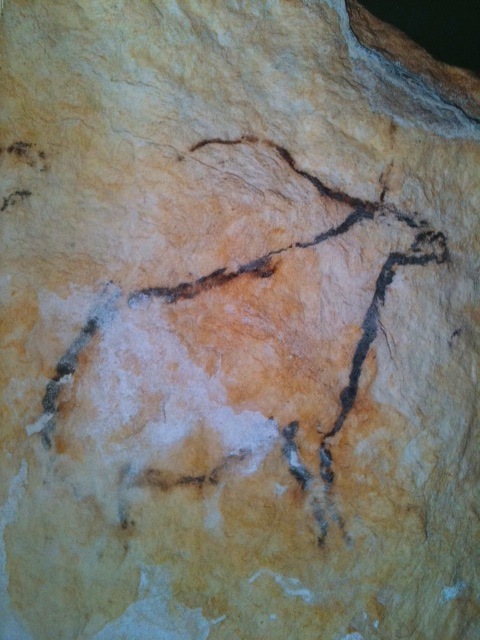 Human remains, rock art and various tools have been found in the caves. Some serious time has been spent researching the articles found and it is believed the caves were occupied as long ago as the Bronze age, by early humans and their animals. You enter through a small building-like foyer by the ticket office and descend down a staircase. At the bottom of this staircase, you are immediately inside the cave entrance with stalactites and stalagmites all around you. Atmospheric and slightly eerie ‘oooh oooh plip plop’ music plays… We were then accosted, in the dark, by a Spaniard telling us to wait a moment. Odd, we thought. Then the people ahead of us had their photo taken by an official photographer who was lying in wait past an impressive rock arch. As we were ushered through it we made “No thanks” signals and felt the camera flash upon us anyway. Once past that, we were in a large foyer with a bit of tourist information, which we duly read. There were a few tools and bowls to view. I have a soft spot for rock art, so was excited to hear there is some here. The rock art depicts deer, goats and fish. Disappointingly, none of it is visible to visitors though, only pictures of it. The theory is that these are the things the artists ate. Reading that made me consider what I draw when I doodle and it is rarely my latest meal, so I’m not sure why they drew the animals. Whatever the inspiration for the paintings, they are lovely though, well, the photos of the paintings. 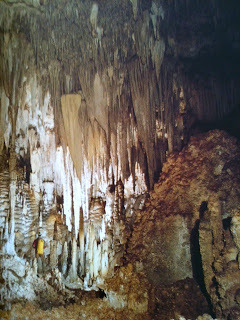 Anyway, moving on, we followed a pathway to the next cave chamber, which was larger and contained seats like a theatre. In the summer concerts are performed in the caves. It’s hard to imagine how people get pianos, cellos or harps down there. There were certain seats I identified as being ones to avoid, either being slightly behind an obtrusive stalagmite or immediately beneath a stalactite of terrifying proportions. As we rounded the next enormous stalagmite the cave opened up before us and become absolutely gigantic. Colossal even. It was such a large open space that it made me wonder how on earth it had enough support and how the roof of the cave held up. These caves were getting more impressive the further we explored them. There is a walkway around the edge of the main chamber. We followed it up steps, around corners and down steps again only to go up more, taking in the magnificent chamber from all angles. Having followed the floor markings around the cave, we then followed them to the exit and up a very modern-world steel staircase. At the top we were obviously identified by a Spanish girl who then caught up with us as we were leaving to offer us the chance to purchase the photo taken of us inside the cave. We looked at ourselves in classic anti-paparazzi pose and managed to resist. 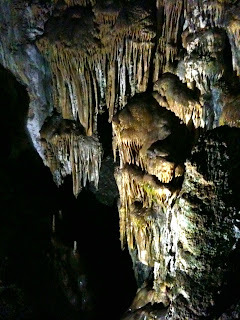 Have you visited many caves? Do you have a favourite?